That would be bread, dear hearts. Oh, how Charlie and I love bread! The best thing ever is Artisan Bread in 5 Minutes a Day, which is a lie, but is still speedy-quick and delicious. Mix the first three ingredients. 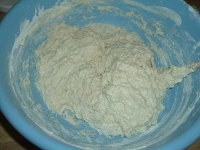 Mix in two cups of flour until fairly lumpless. 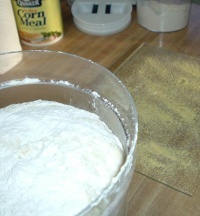 Mix in the rest of the flour. It will be oopy-gloopy. Put it in a lightly covered container and let it double. Put it in the refrigerator and let it chill. Take it out and sprinkle a board with corn meal. 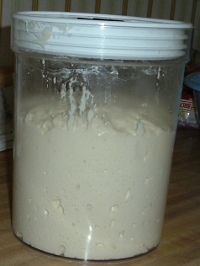 Sprinkle the top of the dough with flour. 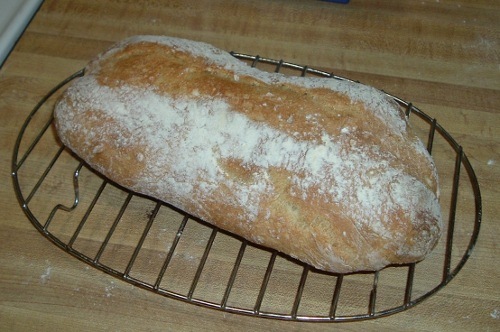 Pull out a big lump of the dough and shape it into a loaf. Let it rise for 20 minutes while you preheat the oven to 450 degrees F for 20 minutes. Sprinkle the top of the loaf with flour and cut a line down the loaf with a sharp knife. Bake for 20 minutes and cool on a wire rack. A WRITING PROMPT FOR YOU: What kind of bread does your main character like? Plain white factory bread? Pumpernickel? Multi-grain? My husband calls plain white factory bread “Styrofoam bread” and our oldest grandson used to call Roman Meal “knight bread.” Come up with some nicknames for your characters to call their own or other people’s preferences. This entry was posted in Food. Tagged bread, recipe. AND now is the time of year when a nice warm kitchen is welcome!